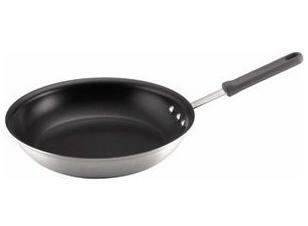 The Teflon® Platinum 12” skillet has to be one of the best of the Teflon® coated cookware products. It’s is made for Maximum Performance, Extra Long Life, Easy Cook and Clean, Excellent Durability and for quality-oriented, avid cooks. The use of cookware with Teflon® nonstick coating eliminates the need for butter and oil (fats) to reduce blood cholesterol and lower the risk of coronary artery disease. The use of nonstick cookware is recommended by the American Heart Association and the National Stroke Association as part of a heart-healthy diet because it allows for cooking with little or no fats. And as a bonus, nonstick cookware means easier cleanup and less time doing the dishes! One (1) lucky Lady and the Blog reader will receive a skillet of their own! Become a fan of LAB’s Facebook Page. Then leave a comment on the wall saying you entered the Teflon® Platinum 12” Skillet giveaway. Tweet this message: “Hope I win the @TeflonBrand Platinum 12” Skillet giveaway from ladyandtheblog.com (@verasweeney). RT to Enter #contest #giveaway”. Fan Teflon on Facebook and leave this link on their wall saying you are entering the Platinum 12” Skillet giveaway on ladyandtheblog.com. this is my entry too – sorry I accidently changed ID!